We’ve asked Steven Roberts, Head of Strategic Transformation at Barclays, to tell us about how they are helping people to feel more confident about their digital skills. Here at Barclays, we’re very aware that some might need a bit more help than others using the latest technology and online services. To this end, Barclays is helping people become more digitally savvy. 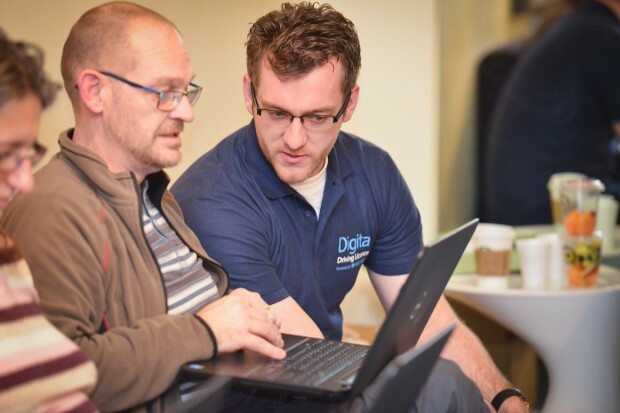 This is one of our commitments to play our part in helping people gain basic digital skills in partnership with the the government’s Digital Inclusion team. In December, we released the Barclays Digital Driving Licence – an app that can help anyone to boost their digital confidence. Free to download, the Licence takes the form of a game with different levels to complete, ultimately earning a City & Guilds digital badge. Designed to be “mobile first” (although it works equally well on a desktop), users complete modules developed by a range of established technology companies including Microsoft, IBM and BT. They can play around, test themselves, and when they get a high score they are sent a City & Guilds digital badge. These badges can be shared via social media, and applied to their Facebook and LinkedIn accounts. When we first launched the app, the peak demographic taking up the Barclays Digital Driving Licence was men aged 40-55: a group that had initially expressed the biggest gap in their digital confidence, and who were too embarrassed to ask for help. With a boost to their digital know-how, we’re now seeing users competing to get to the highest position in the leader board and looking out for when the next modules land. We have big plans to expand the number of modules with an exciting list of contributors busy working on content for the next upgrade. And by making the app available to everyone nationwide we are helping to deliver the skills required for the UK to meet the Government’s ambition to have everyone benefit from the internet, with no one left behind. Do download the app and give it a go. It’s available to everyone and is free to download from both the App Store and Google Play. We’re only just getting started with Version 1 – we know there is lots of potential for the Barclays Digital Driving Licence to continue to grow and develop, so feedback is welcome. Even better, if you think you can contribute any content to improve the qualification, then please let us know and you could have a hand in developing the next module.